Are you tired of buying airplane tickets everytime you have to travel? There is now another option that is available as a new and innovative company moves to upset the aviation industry. A new company "SurfAir" is bringing an entirely new business model to the aviation charter industry. With this new model comes an entirely untapped plan to bill the customer one monthly fee, and with that they enjoy unlimited flying. Surf Air offers no lines, 30 second, YES, 30 Second Booking, no hidden fees, and all while enjoying a "First-class" experience. Their motto "Other Airlines have passengers, we have members", resonates the feel of this new company. For a flat fee of $1599/month (at the time we wrote this post) a member receives 2 re-usable flight passes. This flat fee is completely inclusive. There are no additional fees charged. There are different levels of membership plans that allow you to have more than 2 flights reserved at any given time. These plans allow you to reserve 2, 4, 6 or 8 one-way trips. Currently the elite travel company is flying up to 18 flights a day with departures between Burbank, San Carlos, Santa Brabars and Hawthorne California. As a member you are able to book flights 6 weeks in advance (if seats are available). Image from Surfair.com of their coverage area. The company operates a fleet of Pilatus PC-12's. This is a beautiful six-passenger airplane with a BMW-designed executive interior. It operates genereally quieter then many private jets in flight. However, the size of the plane does restrict baggage. A member can carry one bag that is less than 35 pounds. This really doesn't seem to be a big deal as most members will be travelling for work and returning home the same or next day. Cancellations, no problem, no additional charge. They do ask you to cancel if you aren't going to make your reservation to open up the seat for someone else. The company presents a true desire to hire only top-quality pilots for their charter flights which stands out from the industry norm of pilots flying to earn time and then move on to the larger carriers. The only difference that stands out between SurfAir and let's say Delta is that SurfAir operates on an FAA 135 Scheduled Operations certificate (Charter Operations) versus an FAA Part 121 certificate (Airline Certificate). There are some differences in the operations allowed, but rest assured, the FAA 135 certificate is still restrictive and ensures pilots meet stringent time and duty and experience qualifications. The main difference passengers should be aware of is that the pilot experience requirements are significantly reduced. SurfAir flies in and out of convenient local airports. 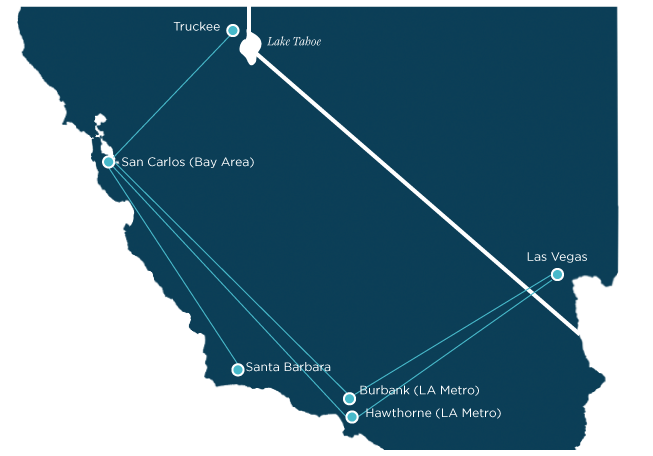 Their first route services the San Carlos Airport in the San Francisco Bay Area, Burbank in the Los Angeles Area, and Santa Barbara. They hope to expand soon to Palm Springs, San Diego, Sacramento, Lake Tahoe as well as the Sonoma/Napa area. This new idea could be an invaluable asset to the business community, an upset to the industry standard "purchase a ticket to fly", and will definitely be one to watch as they expand into the future making air travel unique.